Logic Pro X est la version la plus avancée de Logic. Elle propose de nouveaux outils sophistiqués pour la composition, le montage et le mixage dans une interface moderne conçue de manière à obtenir des résultats créatifs rapidement et à offrir plus de puissance lorsque cela est nécessaire. Logic Pro X comprend une large collection d’instruments, d’effets et de boucles : tout pour créer une musique d’une incroyable qualité. Dismissing the “Do you really want to create a high speed section” dialog when working with Flex inside a Take Folder. Scripter instances that contain code beginning with “NeedsTimingInfo = True” command no longer cause hung notes when Cycle is enabled in the project. It’s now easier to drag values in the Event List. The Velocity tool once again causes the the Piano Roll editor to scroll when click-dragged over the right edge of the window. If the Time Handles option is enabled, then Nudge commands applied in the Piano Roll will shift the Time Handle selection along with the selected notes. Repeating the key command for Part Box: ¼ Note, Part Box ? Note, etc, now cycles through the related dotted and triplet note values. When resizing the Drum Machine Designer plug-in window, there is now a percentage display of of the current size in the upper right corner of the window. If Cycle is enabled, Logic will ignore selected regions and use only its range to determine which portion of a project to include when exporting audio to a movie. �� Les commandes d’annulation fonctionnent désormais correctement après l’édition Flex Pitch. �� Le module Vintage Electric Piano fonctionne à présent correctement à toutes les fréquences d’échantillonnage. �� La commande clavier de capture de la dernière prise n’efface plus les enregistrements MIDI. �� Le fait de double-cliquer sur une région de drummer permet désormais d’ouvrir ou de fermer l’éditeur. �� Le problème graphique qui pouvait entraîner l’affichage d’une fenêtre vide dans l’Éditeur de clavier a été résolu. �� aux problèmes de comportements graphiques et de sélection dans l’éditeur de partition. Resolves an issue in Logic Pro 9.1.6 in which projects with a large number of fades displayed “I/O Error, Result code = -36” when playback was started. The Output Distortion setting for the Compressor plug-in now works as expected with the "ClassA_R" and "ClassA_U" models. Selecting the "Open Apogee Control Panel" command will now launch Apogee's Maestro 2 application if a Duet 2 is attached. Fixes ain issue in which performing undo after recording a MIDI take sometimes caused the MIDI track to stop sounding. The "Toggle Zoom to Fit Selection or All Contents" key command now correctly recalls the the previous zoom view rather than zooming in on the entire project. * Logic's performance while playing movies at larger than 300% native size in 64-bit mode has been improved. * Resolves an issue that could cause the warning dialog "Memory Getting Low" to appear when simultaneously recording multiple tracks in 32-bit mode. * Resolves an issue that could cause the warning dialog "Specified volume doesn't exist -35" to appear when simultaneously recording multiple tracks in 32-bit mode. * Using the Undo command after a "Bounce in Place" command now correctly reinserts used plug-ins on the channel strip. * Performing Undo after using the "Bounce - Replace All Tracks" command now correctly restores all automation. * Resolves an issue that sometimes caused Logic to stop responding when loading a setting for a mono plug-in in a multi-mono surround configuration. * Improves compatibility with 6- and 12-core Mac Pro systems. * Supports iOS control surface apps that utilize the OSC protocol. * Supports REX files when running in 64-bit mode. * Improves compatibility with select Audio Unit plug-ins. * The expanded System Performance window now accurately reflects the number of available real cores on all supported computers. * Logic no longer inadvertently reloads the content for third-party sampler plug-ins such as Native Instrument's Kontakt after tracks are deleted, or after some other edits are performed. * Resolves an issue introduced in Logic 9.1.1 that could cause the spacebar to incorrectly trigger playback in Logic while the Melodyne plug-in window had focus. * Logic Control or Mackie Control hardware control surfaces no longer switch to plug-in edit view when a plug-in on slots 8-15 is removed. * Resolves an issue introduced in Logic 9.1 where using the Marquee tool to trim the end of a MIDI region could extend the number of loops for regions earlier in the same track. * The Piano Roll now updates as expected to show the currently selected MIDI take. * Resolves an issue in Logic 9.1.1 which could cause the Score to not display all notes from a region that had been split with the Scissors tool. * The appearance of downward slurs and ties has been improved in the Score window. * When pasting MIDI events into the Arrange area, the playhead no longer jumps unexpectedly to a position far to the right of the end of the pasted content. * Amp Designer now reliably maintains saved non-default EQ settings when a project is reloaded. * The Wah Wah stompbox now responds more reliably to expression pedal input. * EXS24 loads and plays back instruments that use short AAC or ALAC audio files when Virtual Memory is disabled. * Corrects an issue that could cause the "Next Plug-in Setting or EXS Instrument" key command to change settings on the wrong plug-in. * It is possible again to copy and paste sequences between Voices within an Ultrabeat pattern. * A Software Instrument with a Send set to Post Pan no longer loses audio output when the Aux it sends to is soloed, and the Software Instrument's pan is adjusted. * Software Instrument tracks with the AUNetReceive plug-in no longer exhibit excessive latency. * The Noise Gate no longer creates audible clicks while processing audio with the plug-in GUI open. * Double-clicking an insert slot will close the associated plug-in if it is open and set to Link Mode. * In the EXS Editor, a mouse roll over of an audio file name now displays the full path for the file. * The EXS Editor now properly displays all Groups even those that have the same name. * Resolves an issue which sometimes caused the text after a period in a plug-in setting name to be lost on the first save of the setting. * Resolves an issue from Logic 9.1.1 which forced exported MIDI files to have a .logic extension rather than the .mid extension. * Import of folder tracks from other projects now works reliably. * Bank and Patch names in Multi-instruments now import correctly when using the Track Import feature. * Resolves an issue which could cause the Track Import window to become non-functional in certain rare cases. * Import of stereo Input Channel Strips from other projects now works reliably. * It is again possible to drag split stereo audio files from the Finder into the Arrange window. * The mute status is now maintained for tracks imported from other projects using Selective Track Import. * The "Export Region as Audio File" and "Export Track as Audio file" functions now add tempo information to the exported files. * The EXS24 now automatically locates samples stored in a folder inside the Project Folder that have any of the following names: "Samples," "Sampler Files," "Sampler Instruments," or "Audio Files." * When a project is opened from a project folder that has been copied, EXS24 now loads samples from the copied location instead of the original. * It is now possible to drag and drop an AIFF audio file copied from a CD into the Audio Bin in the Media area of the Arrange window. * The project name is no longer truncated if a period is added to the project name when performing a Save As for the project. * Resolves an issue where applying a crossfade with the crossfade tool might affect existing crossfades on the same track. * A marker is no longer created unexpectedly when the Open Marker Text command is used. * The relative movement of the mouse when editing multiple automation nodes has been improved. * The mouse pointer no longer incorrectly shows the Freeze pointer when editing volume, pan, send, mute or solo automation on frozen tracks. * Help tags for the Marquee Strip now show the correct range. * Soloing an Auxiliary channel strip whose source is a Bus from another Auxiliary channel strip now works as expected. * Copying a MIDI region on a ReWire track no longer creates an unexpected new track. * Cutting a region at a point earlier than the anchor at high zoom levels no longer causes the region to move unexpectedly. * Plug-ins now open with Link mode enabled when they are invoked by entering Plug-in edit mode on a remote control surface. * When a channel strip is muted, pre-fader sends on the channel strip are now muted as expected. * Reordering multiple Control Surface objects in the Control Surface Setup window now behaves more reliably. * Performing comp edits while recording will no longer create graphic artifacts in the Take Folder. * The behavior of the key commands to adjust Marquee selection borders based on transients has been improved. See this article for details. * There is no longer audible stepping with automated volume changes at low fader levels. * Touch automation mode now works correctly with Sculpture's Object Position 2 parameter. * Quantize parameters are now correctly maintained when a region is divided. * The vertical position guide when moving/copying a flexed region is now correctly positioned at the left edge of the region in projects that start earlier than position 1 1 1 1. * The Optimize file(s) command now properly affects both channels of a split stereo file. * Delete now works properly on selected regions within undisclosed groups in the Audio Bin. * Resolves an issue introduced in Logic 9.1.1 that could cause channel strips with default names to display incorrectly on EuCon control surfaces. * The "Reset All I/O Labels" command once again works as expected. * Regions dragged from the Audio Bin to tracks within folders in the Arrange window are now correctly positioned. * Contextual menus now appear as expected when Control- or right-clicking entries in the Audio Bin in the Media area of the Arrange window. * Performing Undo after adding tempo events to a project no longer inadvertently modifies the selections for the active comp in a take folder. * Regions with a negative value set for Delay in the Region Inspector are now rendered properly with Bounce Region in Place. * Bounce Regions in Place now works properly on record-enabled audio tracks. * The current scroll position in the Audio Bin will not jump unexpectedly after renaming an audio file. * The color and icon assigned to a track are now properly maintained when tracks are imported using Selective Track Import. * Using the Backspace to remove all characters in the File Browser's search field no longer causes it to lose key focus. * Imported linked stereo files will now load with all other audio files in a Project without sometimes displaying a dialog that states "Unequal Stereo Regions Corrected." * The MIDI channel number is now appended to the channel strip name when new tracks are created using the "New Track with Next MIDI Channel" menu option. # This update delivers improved compatibility and numerous fixes. * - Compatibility with Novation's Automap feature in 64-bit mode. * - Compatibility with Euphonix Eucon protocol in 64-bit mode. * This update improves overall stability and provides numerous fixes and enhancements. * The update is recommended for all users of Logic Pro 9. Whether you're editing a solo vocal, a rhythm guitar or multitrack drums, Flex Time has a mode designed to give you the best results. New production tools allow musicians to tackle any part of the recording, editing and mixing process they want — and get it done in a fraction of the time. Logic Pro 9 gives you access to your most important edit operations — including cut, copy, paste, fades and crossfades — alongside Quick Swipe comping. Create guitar tablature or detailed scores using a library of more than 4000 chord grids (or your own custom grids) and new ornaments for hammer-ons, bends and more. Hundreds of presets give you Amp Designer and Pedalboard sounds that are ready to go. Start exploring with classic tones, genres, or characteristics like clean, crunch and distorted. La mise à jour Logic Pro 8.0.2 résout des problèmes spécifiques aux utilisateurs ainsi que des problèmes de compatibilité de Logic Pro 8.0 et WaveBurner 1.5. Cette mise à jour est recommandée à tous les utilisateurs de Logic Studio. Pour en savoir plus sur cette version, consultez les Détails Logic 8.0.2. Si vous utilisez Logic Node, vous devez également mettre à jour votre application Logic Node sur les ordinateurs connectés. Après l'exécution de ce programme de mise à jour, vous trouverez un programme d'installation de Logic Node mis à jour et nommé Logic Node 8.0.2.dmg dans votre dossier Utilitaires. La mise à jour Logic Pro 8.0.1 résout des problèmes spécifiques aux utilisateurs ainsi que des problèmes de compatibilité de Logic Pro 8.0 et WaveBurner 1.5. Si vous utilisez Logic Node, vous devez également mettre à jour votre application Logic Node sur les ordinateurs connectés. Après l'exécution de ce programme de mise à jour, vous trouverez un programme d'installation de Logic Node mis à jour et nommé Logic Node 8.0.1.dmg dans votre dossier Utilitaires. Logic Pro 7.2.3 répond à des problèmes de performances lors de l'utilisation de Logic Pro 7 sur ordinateurs Mac Pro et G5 Quad. 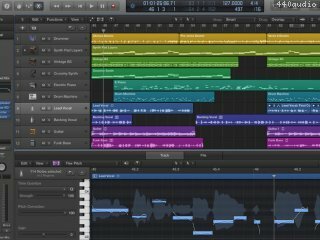 Logic Pro 7.2.3 est recommandé à tous les utilisateurs de Mac Pro et de G5 Quad. Pour installer cette mise à jour, Logic Pro 7.2.1 ou Logic Pro 7.2.2 doit déjà être installé sur l'ordinateur. Remarque : Logic Pro 7.2.3 est optimisé pour les ordinateurs Mac à processeur PowerPC G4, PowerPC G5 et Intel, dotés de 2 processeurs double cœur au maximum. - une prise en charge optimisée des ports audio intégrés. 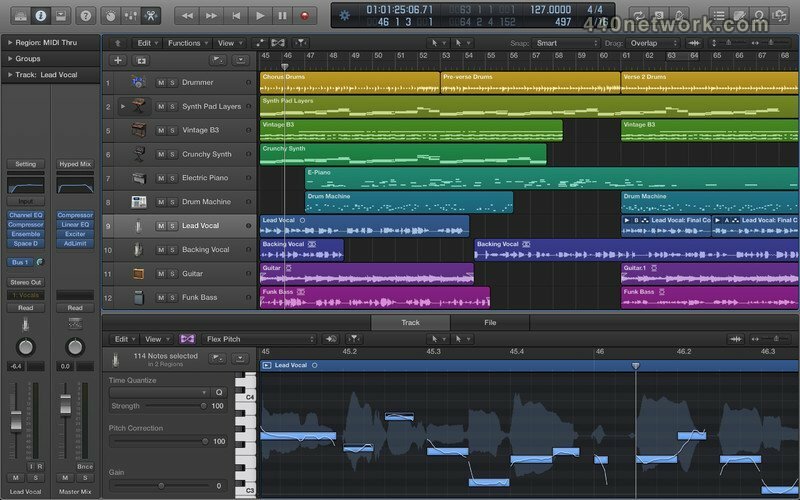 Logic Pro 7.2.2 est recommandé à tous les utilisateurs de Mac Pro. Logic Pro 7.2.1 doit être déjà installé pour procéder à cette mise à jour. La mise à jour de Logic Pro 7.1.1 répond à des problèmes de fiabilité isolés. Elle améliore également la compatibilité avec Mac OS X 10.4 (Tiger). Pour plus d'informations sur cette mise à jour, voir cette page . - Apple Loops s'exécute correctement dans des sessions dont les fréquences d'échantillonnage sont différentes de 44,1 kHz. - Les fichiers Recycle sont systématiquement importés. - Toutes les Acid Loops transposent convenablement dans le Navigateur Apple Loop. - Les pistes TDM sont bien prémixées, même lorsqu'un prémixage natif est configuré sur "Offline". - Les modules Audio Suite s'exécutent correctement, même si des fenêtres flottantes sont ouvertes. - Les deux côtés d'un fichier stéréo séparé sont convertis lors d'une conversion de fréquence d'échantillonnage réalisée dans l'Éditeur d'échantillon. - La fonction Copier/Convertir fonctionne correctement. - Les noms de paramères de modules de Pitch Correction s'affichent correctement. Corrections des Surfaces de contrôle - Logic Control ne génère plus de remarques en mode d'apprentissage. - Tous les noms des paramètres de modules s'affichent correctement. - Les consoles Yamaha n'installent plus des temps multiples dans la fenêtre de configuration. - Les assignations sont désormais disponibles dans la Visualisation des commandes. - Les joysticks Surround fonctionnent correctement. - Désormais les accents dans le séquenceur fonctionnent systématiquement. - Il n'y a plus de problèmes graphiques lors de la copie de séquences par étapes. - L'importation de kits de batterie Factory Ultrabeat fonctionne à présent correctement. - Les voix de batterie commencent la lecture plus rapidement lors de l'écoute, pendant l'importation d'un kit Ultrabeat. - L'automatisation de plus d'une voix de batterie Ultrabeat fonctionne correctement. - Le chargement des réglages de voie n'activera plus le paramètre d'Instrument "Transpose". - Le réglage de la position du micro de Guitar Amp est conservé lors du chargement d'un réglage de voie de Logic Express vers Logic Pro. - Les noms des appareils MIDI de la configuration Audio et MIDI ou de l'Assistant réglages Logic s'affichent correctement dans le morceau par défaut. - Les messages de banques multi-instruments ne seront pas modifiés lors de l'importation d'un morceau à partir de Logic Pro 6.4.3. - La fenêtre "Aller à la position" ne bascule plus involontairement vers la position SPL courante lorsqu'elle s'ouvre. - "Envoi MIDI > Volume Maximum" envoie à toutes les voies et non plus seulement à la voie 1. - Les préférences de tablatures guitare et les définitions d'accords peuvent être à nouveau saisies via des options de menu. - Les mises à jour d'écran se produisent désormais plus régulièrement, ce qui réduit le nombre de petits problèmes graphiques. Correction bug de gestion de surface de controle sous mac bi processuers Correction bug du menu "ouvrir récents"
J'ai démarré avec pro24 sur atari, puis sur cubase atari. ensuite, je suis passé sur mac avec le premier cubase VST. j'avais essaye vite fait logic emagic, mais je n'était pas convaincu. après un raz le bol de cubase devenu de plus en plus usine à gaz, et surtout à une politique de prix des mises à jour scandaleuse de steinberg, j'ai jeté cubase à la poubelle et acheté logic 8. Bonjour à tous, je débarque dans le monde MAC il y à 1 mois, je suis émerveiller par la puissance et le simplicité de Logic et du Mac Pro, j'ai passé 10 ans sous PC avec cubase et tous bon mécanicien on passe plus de temps dans le moteur que dans la voiture......!!!!! tous çà pour dire que depuis je fais vraiment de la musique, et que Logic et révolutionnaire. Excellent produit, puissant, complet, beaucoup de presets et de réglages de tranches très utiles pour gagné du temps. Les plugin qui sont fourni avec sont de très bonne qualité. Un programme plus que complet en en regard du prix qui est une franche rigolade. Signalons une vingtaine de bugs qui sont plus où moins dérangeant, mais qui seront résolu sous peu j'en suis sûr. La version 7.2 avait pas mal de problèmes au début, entre autre le rewire qui ne fonctionnait pas en tout cas chez moi). Mais les problèmes ont vite été résolu, et avec la version 7.2.3 il n'y avait plus de problèmes (je crois, pour ma part je l'utilise en maître rewire avec Live 6 et Reason 4 comme ésclave, et malgré cette configuration gourmande ça fonctionne très stablement) J'ai débuté avec la version 6, et une fois qu'on à compris la philosophie du programme, on s'aperçoit que c'est très simple, le secret est de ne pas cherché trop loin, certes on peut allez très loin dans le midi si ça vous branche. Je ne vais pas dire que Logic 8 et mieux Cubase 4, car Cubase à des fonction intéressante, et chacun à sa façon de travaillé. Personnellement je trouve Cubase trop typé PC, affichage pénible et tout est "dispersé", et comme je suis pro Mac, très peu pour moi. Je suis resté longtemp sur la version 5.5/pc, après avoir tenté Cubase sx 3 et Samplitude, J'ai vite switché sur un Powermac G5 Bi 2Ghz avec Logic 7.1, et vraiment la qualité est au dessus de mes attentes, toujours la même ergonomie avec de nombreux ajouts, stabilité impeccable, Logic est vraiment fait pour les musiciens, excellent ! Je bosse sur LOGIC depuis toujours, même avec son ancêtre Notator sur Atari. La version 7.1 est une pure merveille, aucun plantage en utilisation même intensive. La gestion de l'audio est impressionnante et bien plus facile et intuitive qu'avec ProTools. En tout cas le rapport Qualité / prix est imbattable. A part Vocaline, qui n'est pas dispo sur LOGIC tous les autres Plugs sont top!! Et les pre-sets d'excellente facture. On sent qu'ils ont été mis au point par des musiciens et pas par des blaireaux... Je n'ai que des éloges à faire sur LOGIC et ne m'en séparerai pour rien au monde!! J'enregistre mon troisième Album entièrement sur LOGIC et la qualité et les possibilités ecrasent la concurence sans l'ombre d'un doute!! PS : L'update 7.1 était payante mais ça valait le coup. Me voici sur logic 7.1 depuis 7 jours. Avec un G5 birpo. Rien a dire ça le fait. Je fait des choses que je ne sais pas encore faire avec cubase SX3 et je cherche encore avec 6 mois de pratique de SX!! C'est un soft LOGIC voila ce qu'il me fallait. Logic, je suis tombé dedans avec une version livrée avec ma première carte son (Audiophile 2496). Donc, je suis un peu biaisé (sans le premier 'i' aussi, oui, je sais ;-) ), je ne peux plus m'en séparer. MAIS dans les plug-ins, il y a des trésors qui valent la moitié du prix; j'adore la fenêtre "arrange" (visualisations des pistes et ce qu'il y a dessus), l'hallucinante flexibilité MIDI interne, le piano roll est une Rolls (j'en ai vu d'autres, pitoyables en comparaison); l'implantation dans OS X est apparemment excellente (j'attends toujours un plantage depuis 1 an d'utilisation quotidienne). J'ai pratiqué Logic Audio 5.5 sur PC pendant deux ans avant, et c'était déjà le bonheur à tous les étages! Je ne changerai pas de séquenceur sauf GROS pépin! Et je découvre des merveilles sans arrêt! Et quand on ne peut pas faire comme on veut, on va sur les nombreux forums, et qqn a déjà trouvé la solution pour contourner! C'est bcp d'argent sur le moment, mais c'est pas cher payé. Excellent pour la musique, on peut y faire une maquette qui sonne pro sans logiciels extérieurs. Je le trouve moins précis que Protools pour l'audio pur, mais c'est peut-être une question d'habitude. Les plugins intégrés sont de très bonne facture, avec mention pour les traitements de dynamique et les intruments virtuels. Points négatifs : le manuel en français est à la limite du compréhensible (on sent une traduction laborieuse) ; des petits bugs étranges avec le Coreaudio (rien d'insurmontable) ; un jeu de fenêtres parfois trop encombrant. Cependant, c'est un soft incontournable. Problem....now all my INST plug-ins sound like they're running through a ring modulator. WTF???? Love the retro screenshot we've got here. Please keep it! Glad they are actually releasing updates to fix bugs in logic 9. Logic is awesome, but there are a few bugs still left to fix, so lets hope this continues. What, logic has Plugin delay compansation, one of the best actually. what do you base that on? Superb! i switched from Cubase and I ain't ever going back. Best DAW ever made. Apple takes best choice to go with Logic. Great Spacedesiger for best quality Reverbs at professional level. Very good EQ's. No Plugin delay compansation is a huge disappointment in my view! It's about time Logic was updated in quality instead of features. I'm not sure I can bear with Logic like this much longer if full PDC isn't implemented real soon. Lecteur/Moteur Vidéo & Audio. La solution multimédia d'Apple, pour écouter et lire de l'audio et de la vidéo.